I learned that in Oregon, kidney stones are analyzed by the state's Geological Department. Which makes sense; they have the right equipment for determining the composition of rocks. The down side is that it could take a month or so for them to get around to it for mine (apparently medical analysis has lower priority). I saw Despicable Me (in 3D! ), and enjoyed it rather a lot. If you've seen the previews, you pretty much know what you're going to get, but it's fun summer fare. The biggest event this week was seeing an orthodontist about some braces. * My dentist's professional opinion is that my long-term dental health over the next seventy years would be improved by better alignment, with easier cleaning of the occluded teeth and fewer jaw complications. And I suspect that the irregular arrangement of my teeth is the main reason that I don't have large numbers of women clamoring to date me, so braces should change all that. The main drawback is that it will take a couple years. And I may lose my accent. Still, a small price to pay. Adorable, or tragic? 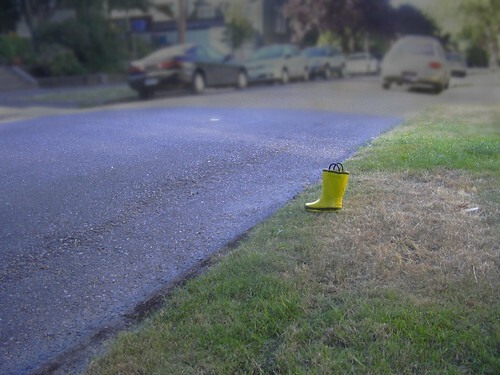 snottygrrl's neighbor thought the image of a single rain boot by the street was adorable, but snottygrrl went right to "street+single boot = TRAGEDY!!" What does it say to you? 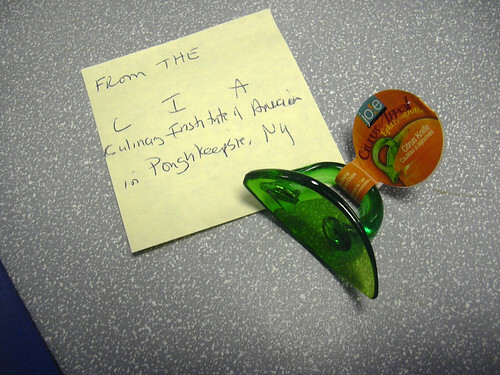 Found this gift from a coworker on my desk when I arrived Monday morning. I think she was mostly amused that the company she bought it from was the CIA. Still, I will never have to wrestle with recalcitrant citrus peels ever again. At the doctor's, for a follow-up appointment for my kidney stone. There wasn't much of interest to photograph in the exam room while I waited, except this. 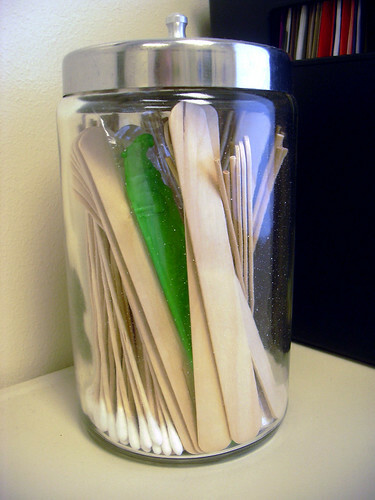 The green one is a hippo tongue depressor. Unfortunately, my tongue was not exceedingly cheerful, so it didn't need to be brought down. Ever photograph your teeth like this? Neither had I. 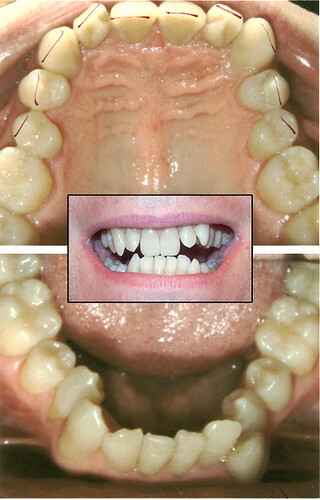 These are orthodontist pre-braces shots; center inset is front view I took. I actually don't have red lines along my top teeth like that; the dentist drew on the photo to contrast my alignment with an ideal smooth arch. Anyway, if I remember in a couple years, I'll post "After" images.